News Update!! : San Bernardino, CA: Latest Information: Deadly Shooting at North Park Elementary School. ZachNews has the latest information regarding deadly shooting at North Park Elementary School in San Bernardino, California that occurred on Monday, April 10th, 2017. Students at North Park Elementary School will be returning back to school on Monday, April 17th, 2017 just a week after a gunman shot and killed a teacher and student inside a classroom. Meanwhile, 9 year old Nolan Brandy has left the hospital as of Friday, April 14th, 2017 and is at home recovering. Doctors said Nolan Brandy could be ready to return to school later this month. Good news to report, 9 year old Nolan Brandy, who was hit in the upper body and was sent to the hospital after the deadly shooting at North Park Elementary School, has been released from the hospital and heading home to his family. The student, identified as 9 year old Nolan Brandy, was hit in the upper body and was sent to the hospital after the deadly shooting at North Park Elementary School. Meanwhile, both San Bernardino County Sheriff’s Department Deputies and the San Bernardino County Fire Department Firefighters gathered up teddy bears for students at North Park Elementary School. According to the San Bernardino County Sheriff’s Department, Deputies from Central Station “dropped teddy bears off at Cal State for the kiddos of North Park Elementary“. According to the San Bernardino County Fire Department, Firefighters from Lake Arrowhead, California “drop off teddy bears collected in the mountain communities at Cal State San Bernardino for students at North Park Elementary School“. A news conference was held on Tuesday providing the latest information regarding Monday’s deadly shooting. According to the San Bernardino Police Department, a teacher identified as Karen Elaine Smith in the shooting and a 8 year old student identified as Jonathan Martinez died in route to the hospital after the the shooting,. According to the San Bernardino Police Department, a 9 year old student was sent to the hospital after being wounded in the shooting. San Bernardino Police Department and School Officials say the 9 year old student was “doing better” and was “up and watching cartoons” as of this morning. According to the San Bernardino Police Department, the suspect, identified as Cedric Charles Anderson, died after shooting Karen Elaine Smith. According to San Bernardino Police Department, Cedric Charles Anderson followed the proper protocol and got into the school through the front office by telling staffers he had to drop something off for Karen Elaine Smith. The firearm used in the shooting was a .357 Smith & Wesson revolver that was sold in 1979 in Michigan, but the firearm was not sold to Cedric Charles Anderson (Suspect) and no further records for the gun are available. The suspect fired 10 rounds into the special needs classroom. San Bernardino Unified School District Superintendent Dale Marsden said North Park Elementary School will be closed Tuesday and Wednesday to give investigators time to complete their work and students and staff time to recover emotionally. “Our hearts are broken. 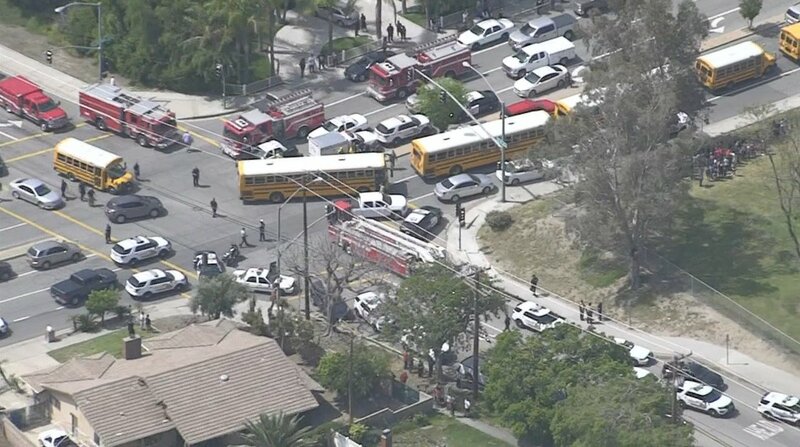 This is truly tragic,” said San Bernardino Unified School District Superintendent Dale Marsden. San Bernardino Unified School District Superintendent Dale Marsden spoke to the news media about his meeting Tuesday morning with the family of Jonathan Martinez. “By all accounts, Jonathan Martinez was a happy child who was born with Williams syndrome and the family wants, in memory of Jonathan, for our nation to be aware and conscious of what is Williams syndrome. This is a genetic condition present at birth and characterized by medical problems including cardiovascular disease, developmental delay, and learning disabilities. Jonathan had had previous heart surgery. These often occur side-by-side with striking verbal abilities, highly social personalities and an affinity for music. An estimated 20,000 to 30,000 people a year in the United States have Williams syndrome. It is known to occur equally in both males and females, and in every culture. We would like the nation to honor his memory, the only son of this family, Jonathan. Unlike disorders that can make connecting with your child difficult, children with Williams syndrome tend to be social, friendly, and endearing. Parents often say the joy and perspective the child with this syndrome brings into their lives had been unimaginable. The district will be announcing an agency that will coordinate further counseling services, services, and donations. We appreciate the outpouring in partnership with HOPE worldwide,” said San Bernardino Unified School District Superintendent Dale Marsden. A candlelight vigil will be held at 7:00pm PT on Tuesday, April 11th, 2017 at North Park Elementary School, located at 5378 North H Street, in San Bernardino, California. NBC affiliate KMIR Channel 6 has posted the raw audio recording from 911 dispatch from the deadly shooting at North Park Elementary School. According to the San Bernardino Police Department, at around 10:27am PT on Monday, April 10th, 2017, a report came in of an active shooter at the campus. A man entered North Park Elementary School, located at 5378 North H Street, in San Bernardino, California. The man, armed with a .357 revolver, opened fire into the special needs classroom killing the teacher and inadvertently hitting an 8 year old student who was behind his teacher. The suspect then reloaded his handgun and used the last round to take his own life. The North Park Elementary School of about 600 students, kindergarten through 6th grade, was placed on lockdown as law enforcement and first responders swarmed the campus. According to San Bernardino Police Department Chief Jarrod Burguan, the 8 year old student was airlifted to Loma Linda University Medical Center, but died on his way to the hospital. According to San Bernardino Police Department Chief Jarrod Burguan, the 9 year old student was taken to the hospital and was listed in critical condition. There were 15 students in the special needs classroom ranging from 1st to 4th grade, along with 2 adult aides. The San Bernardino Police Department called the deadly shooting a “murder-suicide”. It was not immediately clear whether the North Park Elementary School has metal detectors or other equipment designed to prevent weapons from being carried into the campus. The San Bernardino Police Department release the identity of the teacher killed in the shooting as 53 year old Karen Elaine Smith. Karen Elaine Smith dedicated her life to the growth and success of her students. Karen Elaine Smith home-schooled her 4 children, all adults, for 8 years before she went back to school to pursue a career in education. Karen Elaine Smith taught at Cajon High School in San Bernardino, California before she transferred to North Park Elementary School in San Bernardino, California. Karen Elaine Smith was a loving grandmother to 3 grandchildren and loved her family and all of the students she taught; always challenging her students academically and seeing them excel. The San Bernardino Police Department then release the identity of the student who died on his way to the hospital as 8 year old Jonathan Martinez. According to the San Bernardino Police Department, the 8 year old student shot was not targeted and was likely struck by accident. Jonathan Martinez’s family set up a GoFundMe account for funeral expenses. The GoFundMe account’s statement reads, “Ive created this go fund me page for my cousin jonathan who was unfortunately taken from us to soon. I’m trying to help my cousins raise money for funeral expenses & meals to help provide for her family in this time of need. My whole family would greatly appreciate any forth coming donations, the love and support in this time of need. May god bless you all. #@ngeljonathan”. In the last 14 hours, people have donated over $29,569. “We honestly can’t thank everyone enough. We appreciate everyone’s sweet words, and we are very speechless. Thank you coming together. We will keep everyone updated on any further news. My family truly truly appreciates everything from the bottom of our hearts,” wrote Brianna Lopez to all of the people who had donated. The San Bernardino Police Department release the identity of the suspect as 53 year old Cedric Charles Anderson from Riverside, California. According to the San Bernardino Police Department, the victim, Karen Elaine Smith, was the estranged wife of suspect, Cedric Charles Anderson. Karen Elaine Smith and Cedric Charles Anderson married in January 2017 until Karen Elaine Smith left Cedric Charles Anderson over a month later. Karen Elaine Smith’s mother Irma Sykes told the Los Angeles Times that Cedric Charles Anderson had a “different personality” after Karen Elaine Smith left him. Cedric Charles Anderson was unemployed at the time of the shooting but had worked as a maintenance man and a pastor at a church in the Las Vegas, Nevada area. Cedric Charles Anderson has at least 3 adult children. Authorities said Cedric Charles Anderson had been in trouble with the law in the past, stemming from domestic violence and weapons, as well as drug-related offenses. Soon after the deadly shooting, San Bernardino Mayor R. Carey Davis‏ announced a prayer vigil being held at 6:00pm PT on Monday, April 10th, 2017 at Our Lady of the Assumption Church, located at 796 West 48th Street, in San Bernardino, California. A large crowd of people arrived into the Our Lady of the Assumption Church to remember the teacher and student killed in the deadly school. Our thoughts go out to everyone who has been impacted by this morning’s tragedy. North Park classes will be cancelled for Tues. and Wed. The San Bernardino County Fire Department tweeted on Twitter, “Our hearts and prayers go out to those impacted by the shooting at North Park Elementary in SB. We stand united. #SBStrong @SanBernardinoPD“. Michael Ramos, District Attorney of San Bernardino County, tweeted on Twitter, “Our Victim Advocate team has now moved to Cal State San Bernardino to assist students and staff from Northpark Elementary“. Anne and I send our thoughts and prayers to everyone affected by today's tragic shooting at North Park Elementary. Thinking of all those affected by today’s events in #SanBernardino. Previous ​Breaking News!! : San Bernardino, CA: Shooting at North Park Elementary School.